1. A notched storage tray where all your food storage container lids can live happily. 2. Packing cubes that'll help you group together outfits for different days, legs of trips, family members... the possibilities are endless! 3. A splurge-y journal (we tried and loved) built with positive psychology and productivity in mind in case you've found other planners lacking. Each journal covers 13 weeks, so it costs about $124 a year. BUT its methodology is backed by research to help you better break down your goals, find motivation, track habits, and successfully plan your time. Also, we tested it and named it our top-priced pick for the best planner on BuzzFeed Reviews. Get it from Amazon for $33.99+, Uncommon Goods for $32, or The Grommet for $31.95. But if you're new to planning, try our our lowest-priced pick The Simple Elephant Planner for $18.99. 4. Foldable drawer organizers with tiny sections befitting your unmentionables that can easily fit into your drawers. For your drawers drawer. Lololol. Get them from Amazon for $12.50+ (available in six colors). 5. An OG hanging shoe organizer to file away everything from cleaning supplies to toiletries to scarves to leggings to actual shoes. Oh, and it's so cheap you'll buy it in multiples!!! Every door is an organizing opportunity! 6. A beauty tool organizer that'll keep your brushes, sponges, and more under lock and key(ish) from stuff like dust and hairspray. 7. A customizable drawer system with stick-on blocks to keep various tools in order. Made of dishwasher-safe silicone. Includes a non-slip base mat and 15 reposition-able Divitz in three sizes. Read my full review (#11). Get them from Amazon for $34.99 (available in four colors). 8. 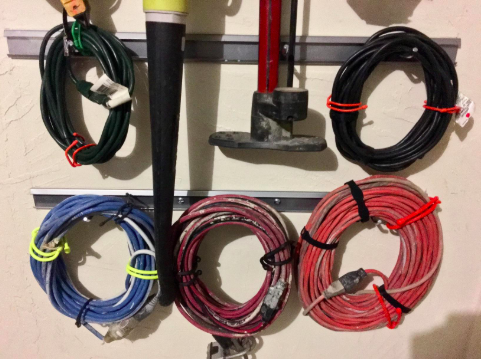 Reusable rubber twists — a better option than Velcro strips to help you keep cables and wires sorted when not in use. Oh, and you can even ~color code~ them! Get a 12-pack from Amazon for $17.22+ (available in a variety of color combos and sizes). But if you're fully committed to hook and loop fastener strips, grab 33 feet from Amazon for $8.99. 9. And a ~flexible~ bungee cord organizer for when you need to safely secure your bag's essentials where you can easily grab them. Give me 10 of these, plz. Get it from Amazon for $14.39+ (available in three colors). Also check out one with a zippered pocket on the back. 10. A bamboo knife block that'll *safely* fit in a kitchen drawer and guard those investment blades. 11. 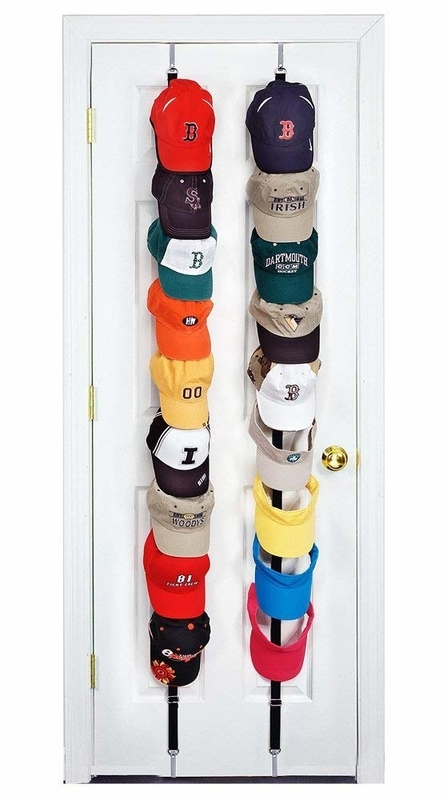 Cap holders so you can clear that shelf in your closet dedicated to your baseball hats. We tried this out and it won as our lowest-price pick for the best laptop backpacks on BuzzFeed Reviews. Not only is it packed with pleasing pockets, it's a solid pick for those who live in wet or snowy environments. Get it from Amazon for $28.99+ (available in six colors). 13. A magnetic bottle-lofting system that'll keep track of the six-pack remnants without making a mess. 14. A tea bag organizer — it can hold 100 bags, so you can finally dedicate your tea shelf to other things. 15. A pour-over coffee filter stand that'll look so nice on your coffee station instead of a plastic bag or box with filters. Made out of ceramic and specifically for Hario filters, but it can hold other filters. 16. A boot storage rack to keep your faves off the floor and put them in front of you so you can see what you have. Get enough for five pairs from Amazon for $76.99 (also available in a standing version). 17. A car seat organizer that'll contain your kid's stuff and protect your car seats from their precious lil' kicks. 18. Sugru moldable glue to help you create the organization solutions of your dreams. Includes eight packs of glue that sets overnight, so you don't have to use it all at once. Can be used indoors and out as it's waterproof, heat- and cold-resistant, durable, flexible, shock-resistant, and electrically insulating (up to 24 volts). Get an eight-pack from Amazon for $19.99 (available in several color combos). 19. A peg system drawer insert for maneuvering pots, pans, lids, and more *just* how you prefer. Get it from Amazon for $41.99+ (available in three sizes). 20. A stackable can rack to help your pantry look like a grocery store of staples. Made from heavy-gauge steel and can store up to 36 cans of various sizes. 21. A corner sink caddy that'll corral the necessary evils of hand-washing dishes. Get it from Amazon for $10.99 (also available in white). 22. A tie holder for storing as many as 20 ties and keeping them in tip-top shape in between wears. Get a pair from Amazon for $9.99. 23. A battery case and tester to mount on a wall or slide into a drawer so you can point your kid in the direction of it next time the remote's batteries are spent. Includes a removable battery tester that doesn't require a battery. Holds up to 93 batteries of various sizes. 24. 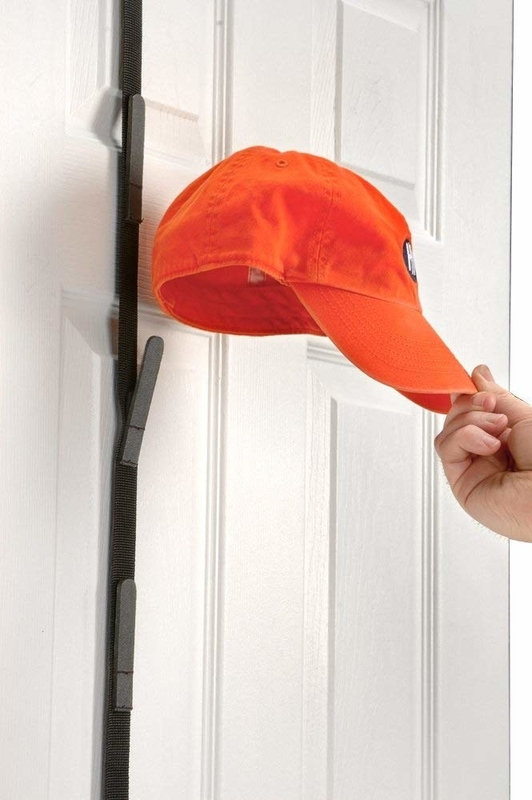 Garage door racks for holding fishing rods, lawn tools, and other long, skinny items you need on hand, but out of the way. Hardware included for easy, no tool installation on standard garage doors. If the door is a hard insulated or wood door, self tapping screws are not included but can be shipped at no cost. Can also be installed on walls and ceilings. Get it from Amazon for $35+ (available in two sizes). 25. An accessories organizer you can hook on a wire closet shelf to put your small purses and wallets within sight for daily perusal. 26. A mirrored jewelry cabinet to help you add an outfit's finishing touches and then admire how it all comes together. Get it from Amazon for $119.99 (also available in white). And check out an over-the-door model. 27. A makeup organizer that'll keep your colorful essentials in order as you like them. 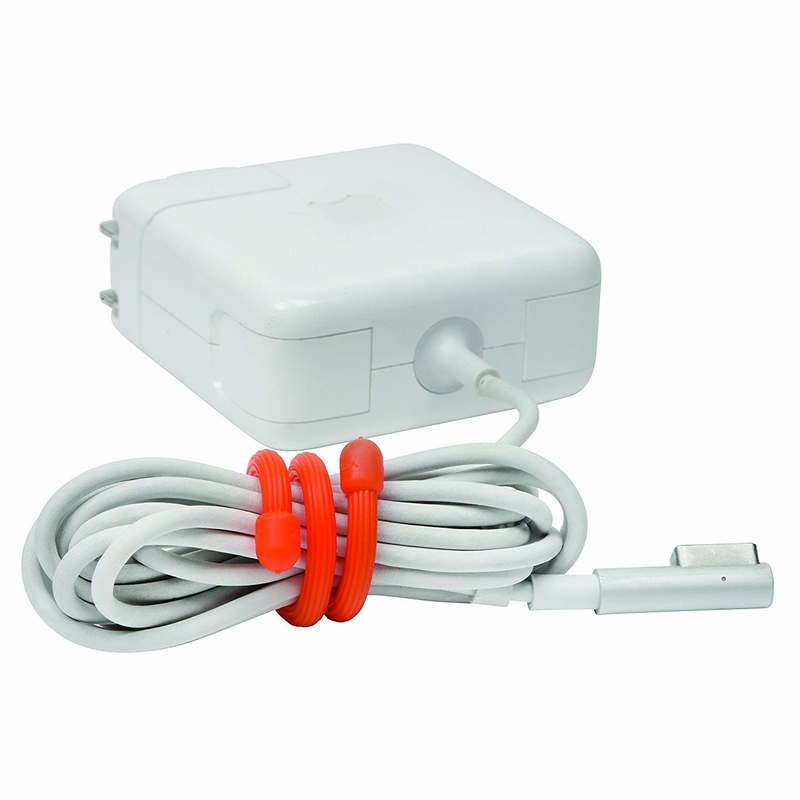 Get it from Amazon for $13.95+ (available in several configurations and colors). 28. 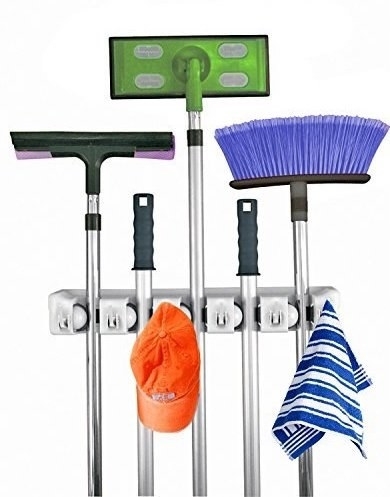 A wall-mounted broom organizer you could use for sports equipment or other long-handled items! 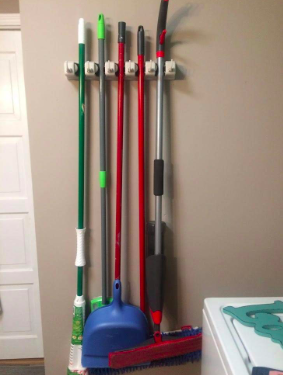 Some reviewers said that super light brooms may slip a bit, but they solved that by wrapping a rubber band around the handle before slipping it into the rack! 29. And a yard tools organizer that'll designate an area for holding onto the heavier stuff you don't want to store on the wall. And it has casters so you can wheel it around where you need to! Get it from Amazon for $60.99+ (available in several designs). And check out a similar sports equipment organizer. 30. A lightweight label maker you can carry around in your tote because some things just really need labels, OK?! It has an easy-type keyboard, one-touch keys, and several styles and fonts (with hundreds of symbols), so you can express your organizational skills in so many wonderful ways!